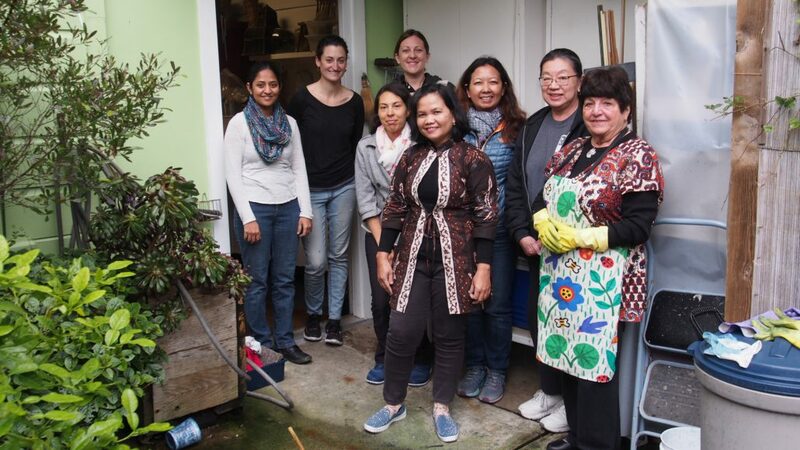 Bu Dalmini (center), a batik artist who directs a collective of 169 women in the village of Bayat near the famous 9th century Hindu temple of Prambanan who make batik, came to the US last January for the first time last January. 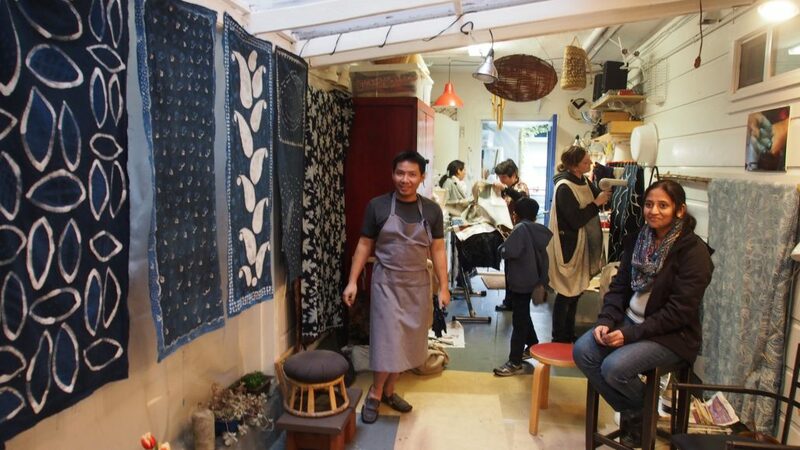 She led a talented group of textile enthusiasts in a batik workshop at The Language of Cloth studio in San Francisco. 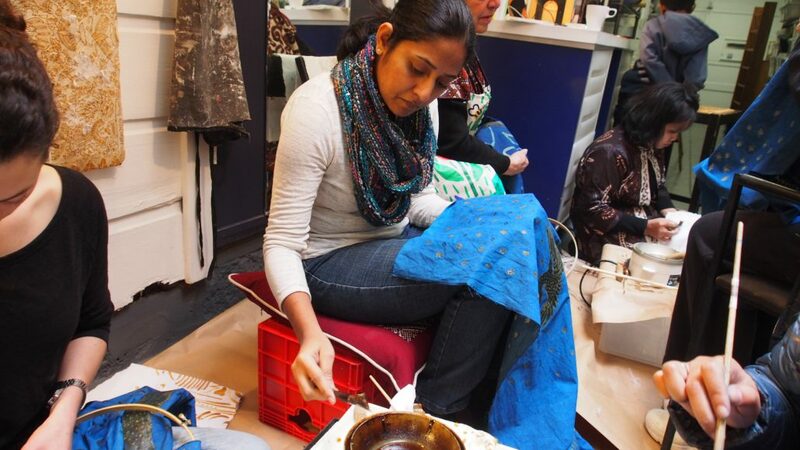 She introduced them to the traditional batik-making process practiced in Java for centuries. 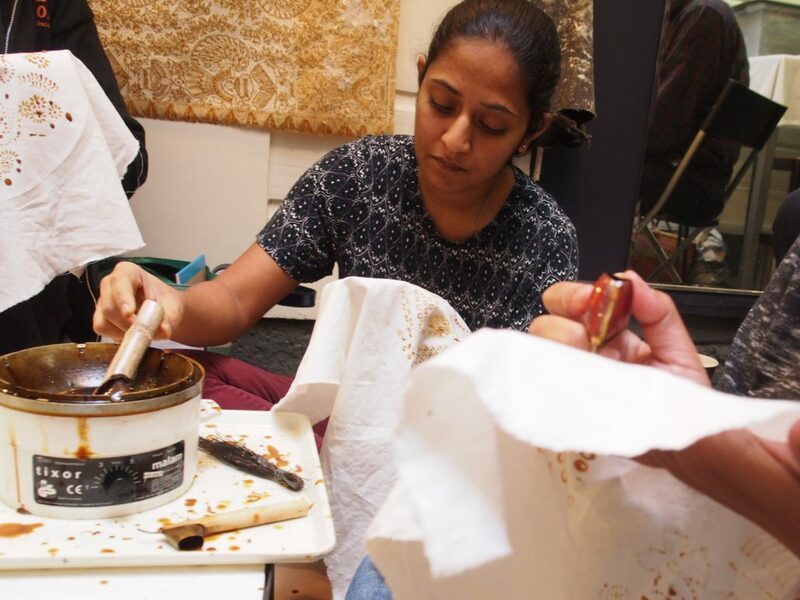 Batik is a wax resist process in which melted wax is applied to a cloth in a certain pattern or design, and then the cloth is immersed in a dye bath.When the wax is removed the areas that were covered have not taken up the dye and the pattern is revealed. 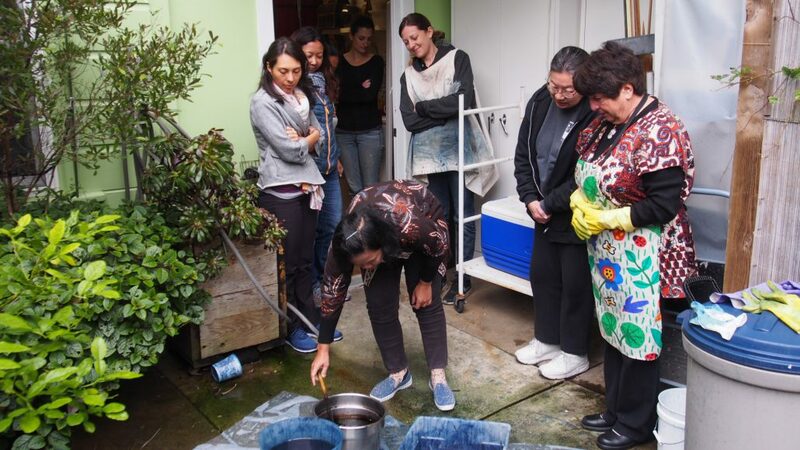 This batik workshop offered the participants the experience of learning the batik process in the same way that young girls learn it from their mothers in Java. 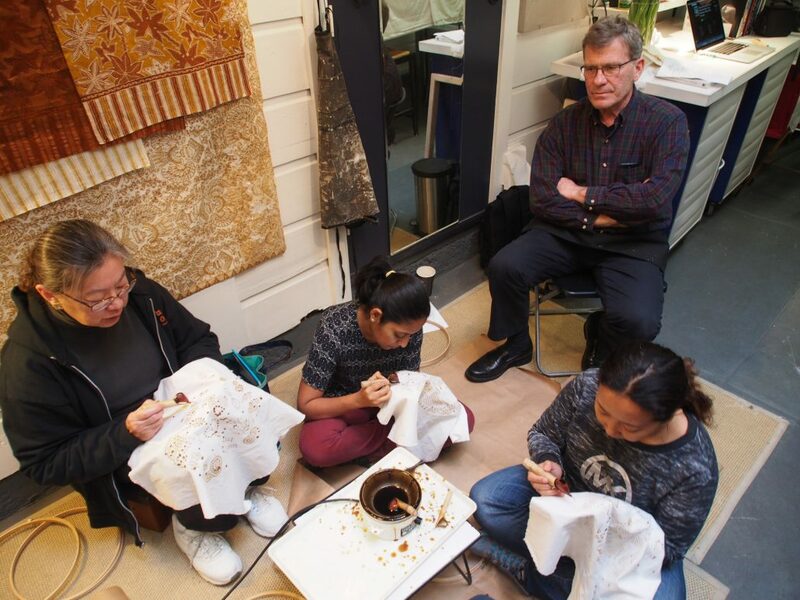 The first step in learning to batik, is to get a feel for the way the wax flows from the canting. The most basic application is to make a dot. In fact the word batik is derived from the word nitik which means dot in Javanese. Applying a simple dot is not as simple as it would seem. The angle at which the canting is held will determine the volume and speed and flow of the wax. The temperature of the wax also is a factor. The hotter the wax, the faster it will flow. Holding the point of the canting on the surface of the cloth longer creates a larger dot as the hot wax wicks outward on the cloth. The tip of the canting is never pressed into the cloth or it will snag and stall, creating a blob of wax. 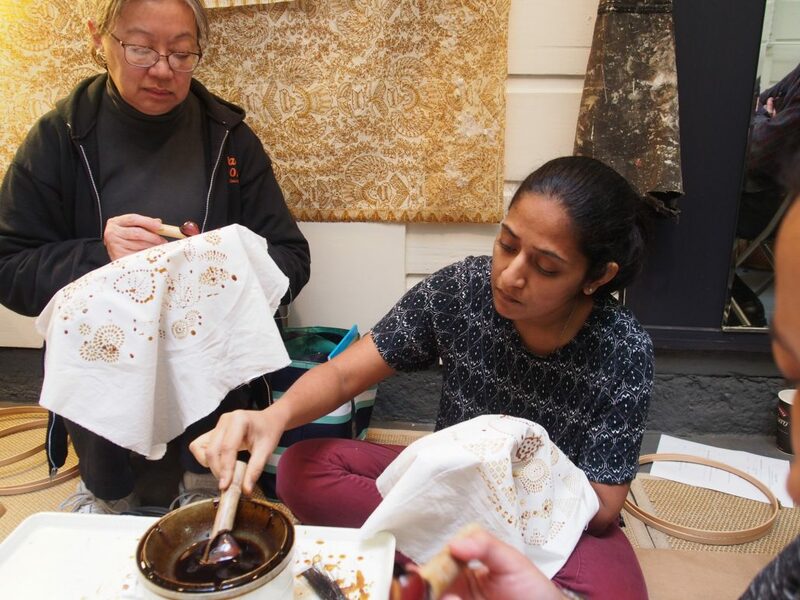 It only lightly brushes the surface of the cloth and then with a slight flick of the wrist the angle of the canting is raised to stop the flow of the wax. 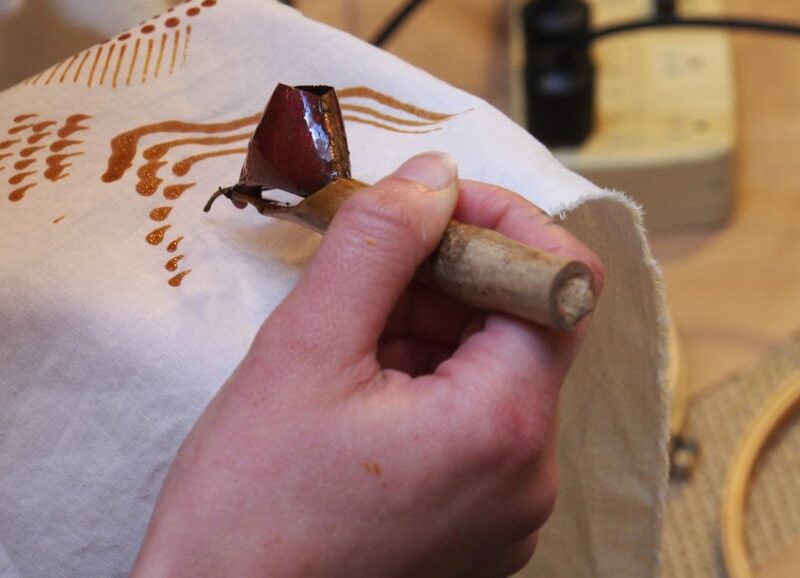 In this close-up the canting is held for a moment to make a dot, but without lifting from the cloth it is moved across the cloth to create a different shape. A drop of unwanted wax is about to fall from the base of the spout, but the mistakes are all part of the learning process. 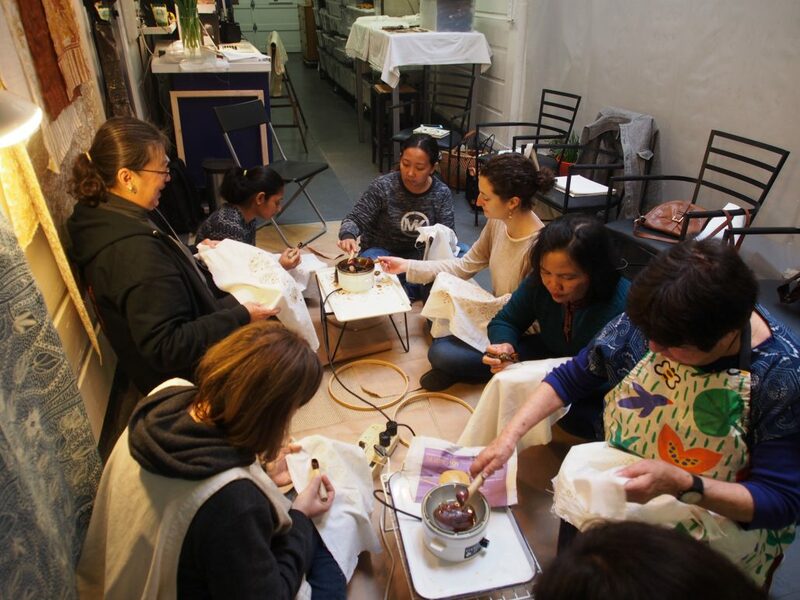 Although embroidery hoops were available to make holding the cloth easier, most of the batik workshop participants chose to hold the cloth underneath with one hand while applying the wax with the other, as is traditionally done in Java. On the wall to the left are waxed cloths in various stages of completion. 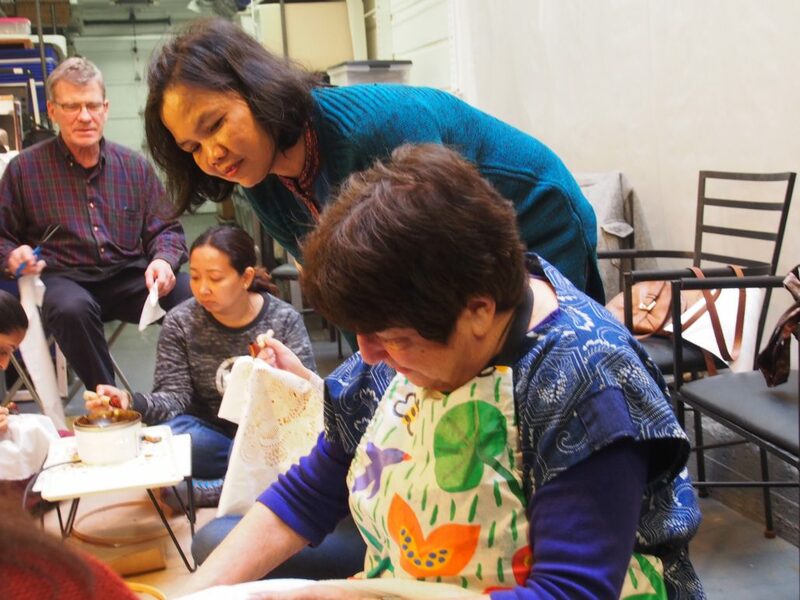 Bu Dalmini was impressed with the dexterity of the participants in this, her first beginner batik workshop in the US. We used waxpots with very accurate thermostat controls to get the temperature of the wax just right. 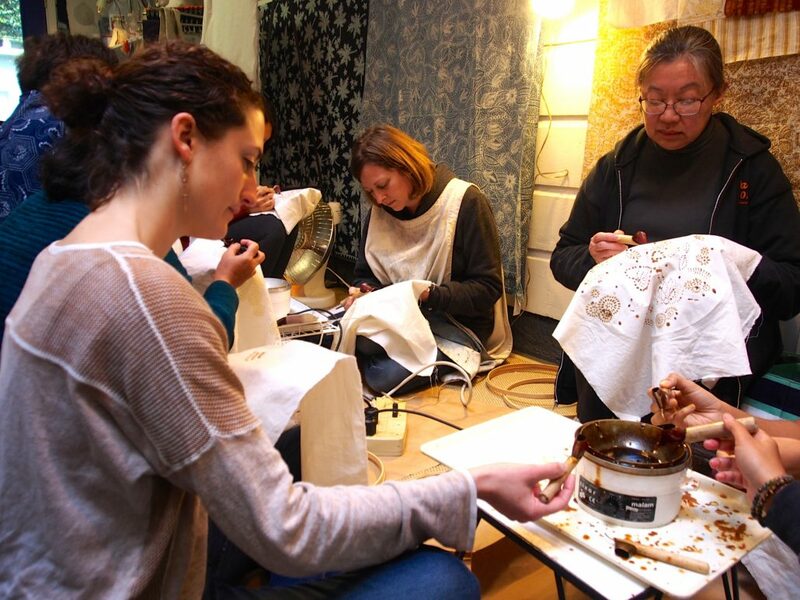 It was a two-day of the batik workshop. The first day was spent practicing technique and the second day was devoted to a personal project. The cloth on the wall behind is a traditional kain panjang with a motif that was originally restricted for use only by members of the Sultan’s family. You see just the first application of wax on the cloth. It was purchased in this unfinished stage years ago by Rudolf Smend as an example of the first step of the many steps required to produce a fine cloth. The next step would have been an immersion dye bath of the traditional soga brown color typical of the batik coming from the kraton in Yogyakarta or Solo. 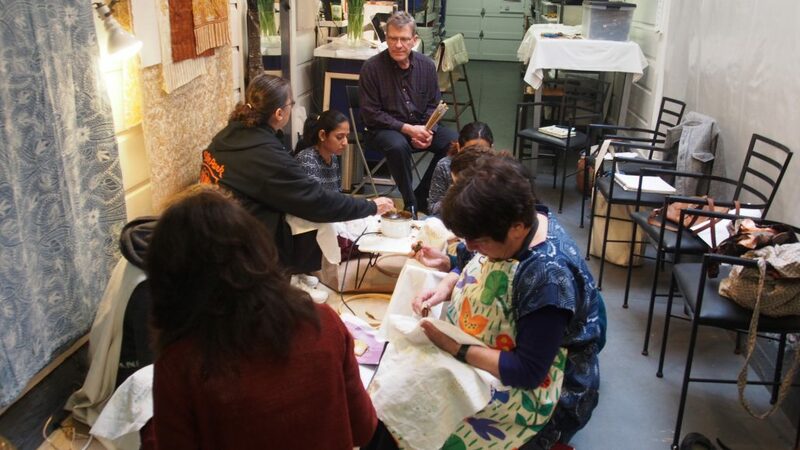 The participants in this photo are trying their hands at using a brush to apply the wax. A brush is useful for covering large areas with wax, and for applying heavy lines. 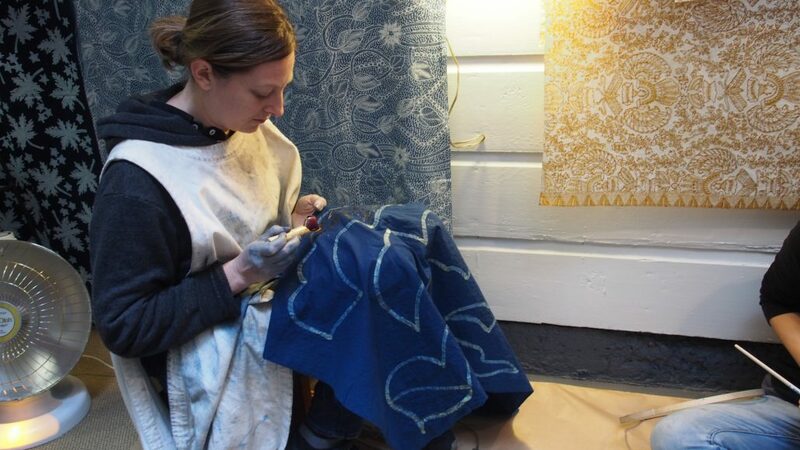 Here Kristine Vejar of A Verb For Keeping Warm is applying wax to an indigo dyed cloth. It will be dyed a second time to produce a darker shade of blue before removing the wax. The lines where the was was removed will be a lighter shade of blue. 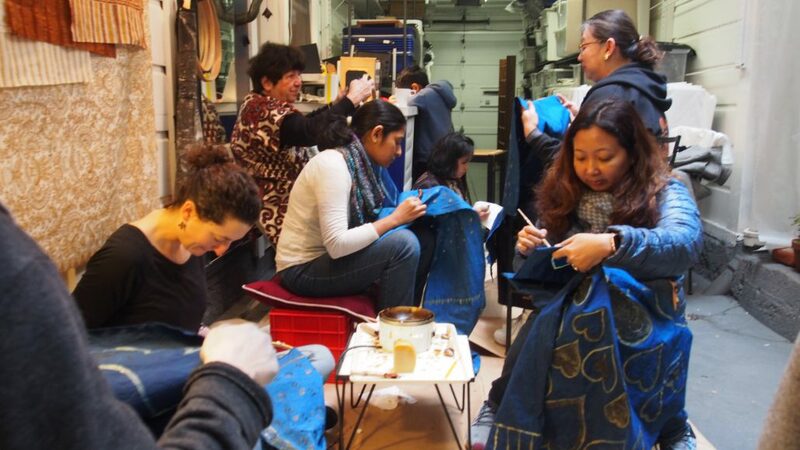 It’s the second day of the batik workshop and the personal projects are taking shape. Bu Dalmini assured us that there are no mistakes that are not useful in the learning process. In Java, young girls learn the craft from their mothers and grandmothers and become masters only after years of practice in making mistakes. Melted wax has a way of breaking your heart when after you’ve struggled to make a beautiful and perfect cloth an accidental spill ruins sit. It is possible however to correct the mistakes by carefully removing the mistakes with a Q-tip and boiling water. Time to color the batik. 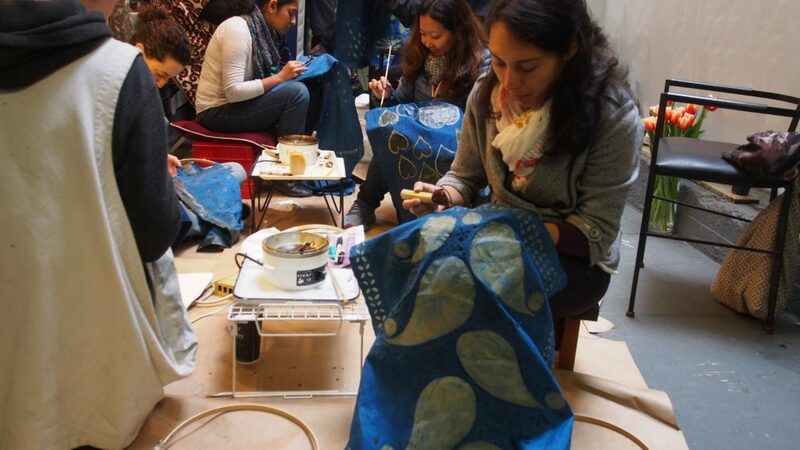 We used two colors, indigo and jelawe, both derived from natural sources. 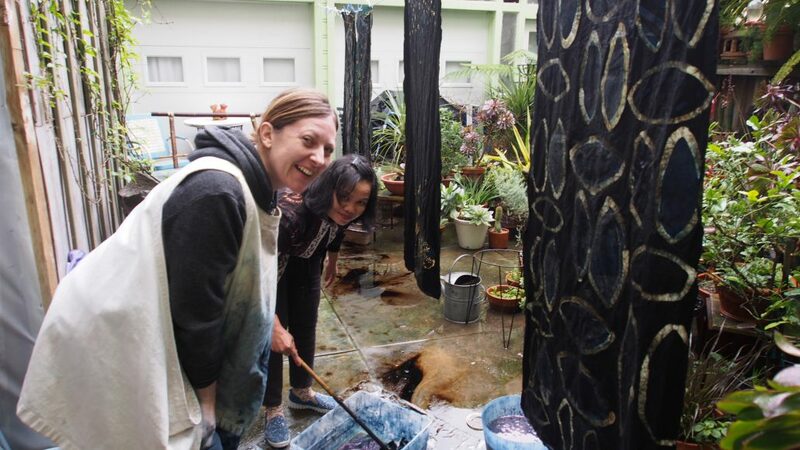 Dyeing was the easy part of the batik workshop. 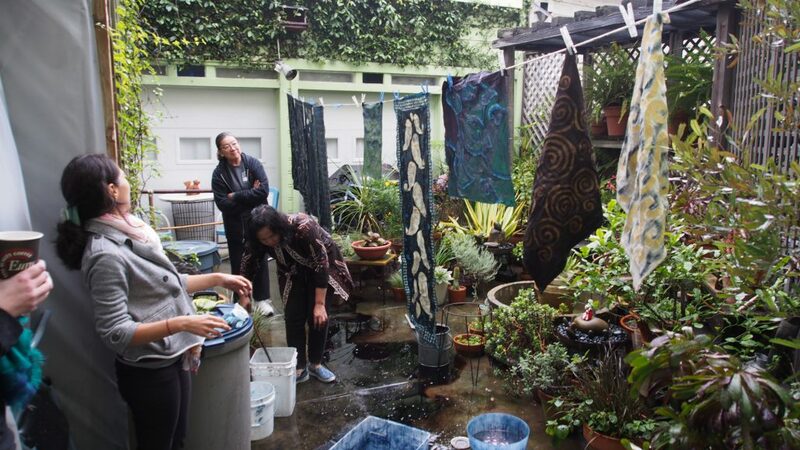 Don’t worry, it’s natural dye made from plants. 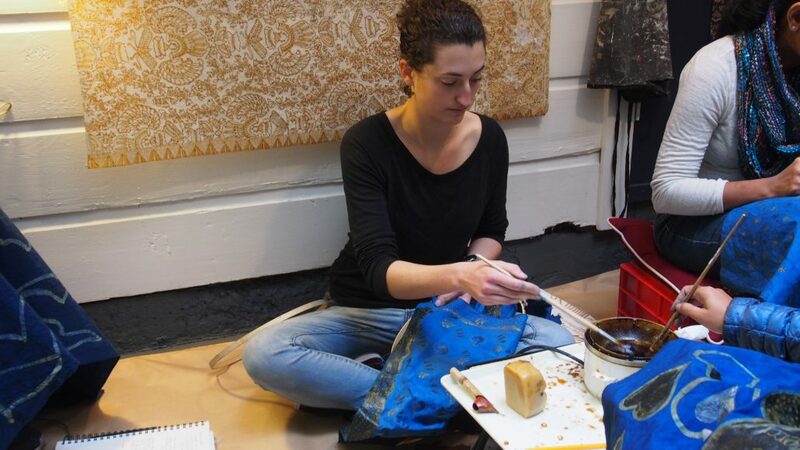 After the wax has been removed from the batik, it’s time to see the results. Each piece is unique. 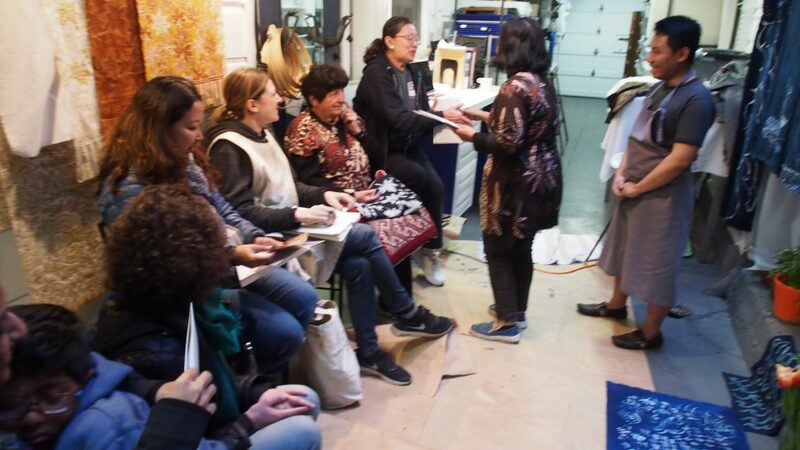 At the end of the second day of this batik workshop Bu Dalmini passed out certificates of achievement to each participant, but the best reward was the experience itself. The finished cloth tells the story. Batik has told countless stories over the centuries, and this one will be an unforgettable one for these women.